I don't particularly like poison markers being "red" as Marvel wound markers are red and (I think) can be used in any game, though that is a very minor point. I'm also not a huge fan of yet another anti-hero unit, but that doesn't mean the design is flawed. One question, one request. Is Poisonous Bite supposed to stop working once all the Ragweb Spiders are dead? I'm pretty sure that is how it works the way it is currently worded. Also, would it be possible to get a picture of these spider minis next to some Fyorlag Spiders? I'd like to get an idea how well they stand out. The way we play, and is supposed to be played, is that it stops working like this. 1) bite the hero, place marker. This review is going to be fairly straight-forward. Simply put, I've had a ball playing Super Bogue's Beakface Sneaks. Flocking is thematic, fun, and encourages aggressive play (always something I like ). Evasive helps them to close in, but keeps their master defense low enough to keep their points in check. Glide is another thematic power that doesn't come into play much on many maps, but is a nice boost when it does. The points seemed spot-on. One concern I had was that Flocking allows these guys to move any Raptorians, including heroes, but, with only two attacks per round, and the limitations that the Sneakbeaks must attack to activate the movement, and that the moved figure doesn't get to do anything besides move, I don't believe it will make them even as, much less more, powerful than the many 4-member, full bonding squads. It simply is a nice change-of-pace power that helps keeps heroes in the game. I vote YES to induct Super Bogue's Beakface Sneaks into the Soldiers of Valhalla. Killometer likes aggressive play! Dog bites man! News at 11! Hey Killo, the OP still lists Dad_Scaper as a judge. You may want to remove him before he gets any ideas. It does, and unfortunately I'm going to have to vote NO to review the Ragweb Spider, because it doesn't do what you intend. Special powers go away when all figures associated with the army card die, except when explicitly stated otherwise. You need wording like "for the entire game" that Rod of Negation uses. Last edited by Scytale; May 16th, 2012 at 09:03 PM. 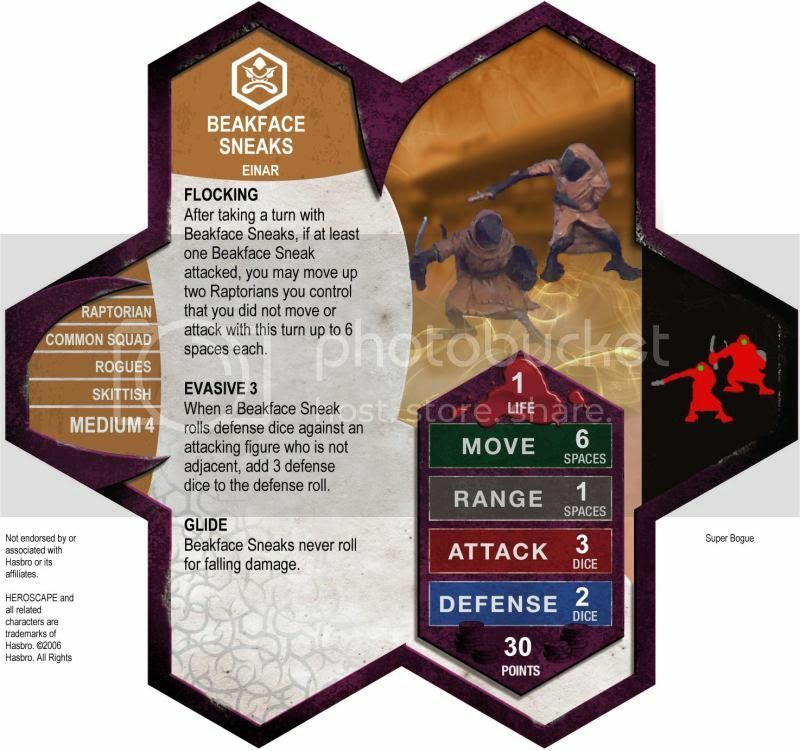 I'm excited that the Beakface Sneaks got such a good review. I couldn't resist getting three squads of them when it only cost me five bucks. I will have to get them out and give them a go. @killometer--I would be interested to hear what some of your army builds were with the Beakface Sneaks. I played them with a lot of stuff. Running just Sneakbeaks x10 at 300 points was a guilty pleasure. Obviously wrapping them in Bacon really helps them stand up when charging at ranged units (7 defense is reeeal nice when having to fight through hordes of rats), and helps mitigate their fragility once they're engaged. In general they were very versatile, and paired well with lots of stuff. Long range is nice, because it helps draw your opponent in near enough for them to be able to attack to activate Flocking, but not mandatory, since Evasive usually helps them close in anyways. They're inexpensive enough that you can buy a lot of them and still have room for some heavy hitters, or you can take just drops 2-3 squads into your army and use them to harry your opponent. I'm looking forward to someday having a Raptorian hero to help maximize Flocking. There's a cool Kenku Wing Mage figure. Auggies has it for $2. I vote for Ragweb Spider. I think the D20 roll on Poisonous Bite may need to be adjusted, but I will see how the card plays out in testing. Interesting, that figure looks familiar. to review Rageweb Spider. Scytale brings up a good point about the wording needing to match the intent, but now that I know it, I can test it as such. It should be fixed now though and resubmitted. Last edited by nyys; May 18th, 2012 at 08:49 AM.